It is 800 years since one of England's most reviled monarchs, King John, died from dysentery. BBC News examines how this gut-wrenching condition has claimed the lives of several English kings, changing the course of history. "Foul as it is, Hell itself is made fouler by the presence of John." Chronicler Matthew Paris's epitaph reflects the contempt with which John was widely held - but could also be a nod to his unpleasant demise. His chaotic and disastrous reign came to a heaving end on, or near, the toilet. 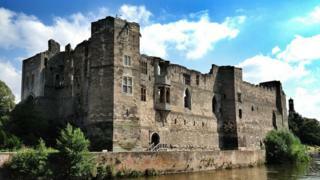 Or whatever served as a toilet in Newark Castle in October 1216. By finishing John, dysentery - essentially diarrhoea so violent it causes bleeding and death - may have spectacularly changed the course of English history. And it was not the only time it managed to kill a king or set the country on a new course. "He was a total jerk," says Marc Morris, author of King John: Treachery, Tyranny and the Road to Magna Carta. "He was loathed by contemporaries as cruel and cowardly. "Many people think of medieval Europe as a place where anything goes, like Game of Thrones. "But there were rules, especially about how you treated nobles. John broke these taboos. "He didn't just kill, he was sadistic. He starved people to death. And not just enemy knights, but once a rival's wife and son." Losing swathes of inherited territory in France, and then pushing up taxes to fund vain attempts to get it back, alienated his subjects in England. A reputation for being a sexual predator with the wives and daughters of nobles, along with arbitrary treatment of both allies and rivals, angered the elite. He annoyed Pope Innocent III so much the pontiff excommunicated John and ordered England's churches closed. All this led to civil war, Magna Carta and a French prince, Louis, being offered the throne. But while fighting, John became weak and sick. Travelling from Norfolk towards the Midlands, he halted at Newark and soon after died. Rumours put his demise down to eating unripe peaches, drinking too much sweet ale or even being dosed with poison from a toad. Dr Iona McCleery, an expert in medieval medicine at the University of Leeds, says: "To say John died of overindulgence was a way of criticising his personality. It implies intemperance, gluttony and imprudence. "To say he was poisoned showed he was hated. Whatever the truth, those writing down history had nothing good to say about John." Dysentery is caused by parasites in the gut but is also easily confused with other viral and bacterial infections. It is most commonly spread by dirty water or food being contaminated with human waste. Dr McCleery says: "Dysentery was not necessarily a condition of the commoner. Lots of vegetables were grown in soil fertilised with human waste. "John had been on the march, fighting a war, under a lot of strain. "He was probably physically and emotionally exhausted and living conditions on the march can be primitive, no matter who you are." After John's death the fire went out of the civil war and Prince Louis was chased from England. Stability returned, the Magna Carta took root. But dysentery was not finished with the fate of England or its kings. Edward I, the Hammer of the Scots, died of it on his way to renew war with Robert the Bruce in 1307. His son Edward II lost the resulting battles and Scotland retained its independence. It may have accounted for Edward, the Black Prince. Famed warrior and statesman, his death in 1376 the year before his father Edward III, meant the Black Prince's son, Richard II, would became king aged 10. Richard's reign ended in rebellion, overthrow and death. Dysentery also killed Henry V, hero of Agincourt, while campaigning in France in 1422. Henry VI became king at nine months old. The adult Henry VI was utterly unsuited to medieval kingship and was subject to catatonic fits. France was lost and rebellions sparked the Wars of the Roses, which wracked England until 1485. But in ending John's life when it did, dysentery may have had its greatest impact. Dr Morris says: "Many kings could be, by our standards, cruel but John was cruel, cowardly and a failure. "But by dying when he did, it meant Magna Carta, which he had rejected, would be reissued. "By default, his legacy was such a rule would not be repeated, through a document which still symbolises the rights of the subject against the power of a tyrant." And while dysentery may sound to many of us like a disease of the past, it is still a major killer in developing countries. The World Health Organization estimates nearly 900,000 people die from dysentery or similar diseases every year, the vast majority young children.